Beautifully restored bungalow, walk to dining, shopping, outdoor cafes, & Starbucks and Sunday Farmer's Market, Lake Eola Park. And less than a mile to the courthouse, Publix, FreshMarket, and downtown Orlando. Walk or Bike everywhere! This beautifully restored bungalow has large kitchen, great front porch, romantic dining room and bedrooms. Wood floors throughout, fresh 1000TC white linens. The property shares and enclosed back courtyard with the rear studio (vrbo 3506144)and the guest house (vrbo 490078). Both of which are available to rent unless owner occupied. 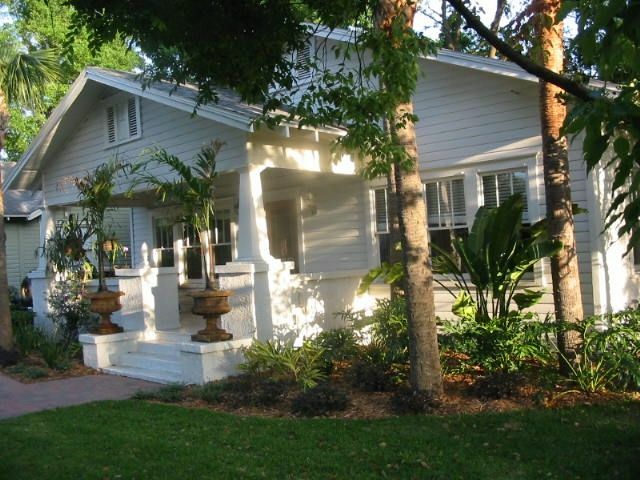 Keywords: bungalow, house, walk to dining & shopping, historical district, tree lined streets. I am an Interior designer/ architect and I love to travel. I have lived in many great cities (NYC, Aspen, Miami, and LA) and I always come back here. I use VRBO wherever I go. It's the greatest way to really get to know how the locals live, find the best restaurants, and enjoy walking communities. Orlando is a great city. I grew up here. Whenever I leave Orlando, I am reminded of the great weather, interesting people, and ease of living here. You can walk/bike/ uber everywhere and there is always something interesting going on. Great local neighborhood vibe! Walk to dining, shopping, boutiques, Sunday farmer's market, and events around Lake Eola. With close proximity (5-minute Uber or rickshaw/ 10-minute walk) to Downtown Orlando, Performing Arts Center, Amway Arena, and movie theaters. 30-45 minutes to the Beach, Disney Area & Theme Parks & Convention Center. Tub & shower, towel warmer, crisp white towels, stone floors. Large front porch. Shared back patio w/ outdoor grill and dining table. Walking distance to dining, Starbucks, Publix grocery store, parks and Downtown Orlando. Historical tree-lined pedestrain sidewalks and brick streets. 2 blocks from restaurants, shopping, Starbucks, Lake Eola, outdoor cafes. Near I-4/ and the 408 expressway. Easy driving to all the attractions, but I recommend staying in Thornton Park.